After taking a sip of a cold brewski, most consumers don’t think about how much the price of that beer was marked up by various taxes. A sumptuary tax, commonly called a vice tax, is a tax on a product or habit generally viewed as socially undesirable, such as alcohol, tobacco, and gambling. Whether or not the taxes effectively deter anyone from these behaviors is up for debate, but they certainly bring in a lot of revenue for state and local governments, as well as at the federal level. One problem critics have with beer taxes is they are largely hidden from the average consumer. Beer is taxed in a multitude of ways before it reaches the customer, but these taxes are built into the price, and beer drinkers then pay sales tax on top of that. If you add up all the taxes levied on the production, distribution, and retailing of beer, they amount to more than 40% of the retail price, according to the Beer Institute, a lobby group representing the beer industry. Not only do beer excise taxes lack transparency, but they also appear to disproportionately burden low-income consumers. An analysis by the Beer Institute found the tax on beer is one of the most discriminatory, with households earning less than $50,000 per year paying roughly half of all beer taxes, while accounting for less than one-fourth of all income earned in America. It should be noted that the Center for Science in the Public Interest takes umbrage with certain beer industry statistics, arguing that the roughly 40% markup calculation includes associated payroll and incomes taxes, and that it’s not the working class who pays the bulk of beer taxes, but the heaviest drinkers. These numbers bode well for beer brands, but bear in mind the global beer market is also practically monopolized by one brewer, a company represented by the Beer Institute. Anheuser-Busch InBev is the world’s largest brewing company, with over 45% market share in the U.S. and 68.2% in Brazil. In 2014, AB InBev took in more than $47 billion in revenue. Some states are more complex than others, each with its own rules governing beer excise tax rates. Some states tax beer differently based on the size of the brewer, for example. According to the Tax Foundation, state and local governments can also include fixed per-volume taxes, wholesale taxes at a percentage of a product’s wholesale price, distributor taxes, and case or bottle fees, sometimes varying based on the size of the container. Let’s take a look at just how high beer taxes can get across U.S. states. Beer excise taxes range widely in the U.S. from a low of $0.02 per gallon in Wyoming to a high of $1.29 per gallon in Tennessee. The following list is ranked based on the highest tax rates as of January 1, 2015, in dollars per gallon. The information presented is provided by The Tax Foundation. Here are America’s 10 worst states for beer taxes. 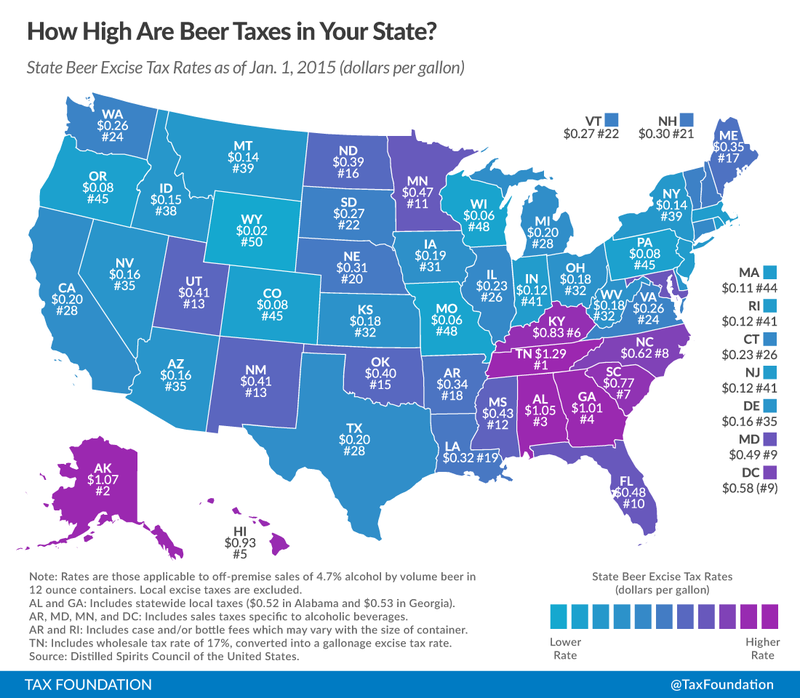 The Tax Foundation also published the map below, showing the full range of state beer excise tax rates for 2015.